Lily Pond Tents are a square shaped tent with veranda, made up of two layers of cotton cloth, bamboo poles, pegs, ropes, etc. We offer a wide array of Lily Pond Tents which are artistically designed for a comfortable stay. One can relax on the breezy veranda or entertain within the beautiful suite within. Our range is widely demanded and accepted all over the world for their smooth finishing, attractive colours, unique designs, and weather resistant. 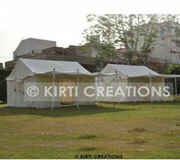 Our water proof and highly reliable tents are available in different shapes, sizes and patterns. This white colored Fabulous Lily Pond Tent looks fabulous and is an luxurious place to stay for relaxation. Its whole interior due to the nice covering of Fabulous Lily Pond Tent gives the feeling of a home in outdoor.